Hi all , new here . 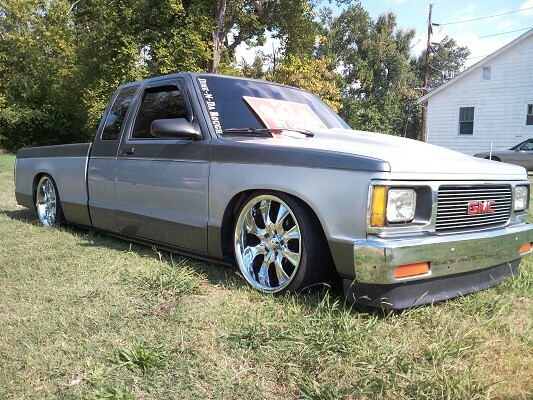 im riding a 91 ext cab s10 bagged on 18s , daily dragger. looking to hook up with a club to further friend ship and fun . truck was for sale , but i decided to keep it and toss some more money in it . i love me a clean 1st gen =] WELCOME! thanks all glad to be here , and acutally its a chevy not gmc, i just had a crome gmc grill so it got tossed on it lol , will soon be replace with a clean billet pretty much stock other than flowmaster , b&m shift kit and laying frame lol , and a in dash but it does only have 120,000 org. miles on a 4.3 auto its a daily dragger ..
Subject: Re: New here western ky,.